We are in love with our morning coffee. What could be more American? Coffee more than pie? Just possibly! 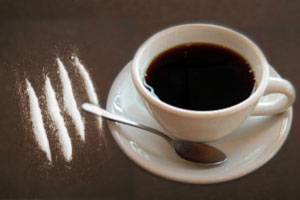 What if our morning caffeine were illegal? What would we do? Hoot and holler. I imagine we would do our best to drink our morning brew in whatever way we could. Coffee for many of us is our way, at a minimum, to start our day. We would do whatever we might do to have our daily caffeine. You want to illegalize my morning intake of caffeine? Get out of my way. But in fact, attempts have been made to regulate caffeine. Those who are married to a present day cocaine use may encounter a similar contemporary landscape. What if cocaine use were illegal? Oops, it is! Put another way, How to come to terms with America’s affection for cocaine? The question has befuddled the country for decades, yet the attraction of cocaine continues unabated. Officially banned in the U.S. in 1922, by 2008 cocaine was still being used by almost 2 million U.S. citizens according to the National Survey on Drug Use and Health (NSDUH). The Incas of Peru once used coca leaves to help adjust to altitude in the Andes; Americans do the same more or less seeking help in an adjustment to exactly what? Unknown. Drug Free World reports that in the United States cocaine continued to be the most frequently mentioned illegal drug reported to the Drug Abuse Warning Network by hospital emergency departments in 2005 and that there were 448,481 emergency department visits involving cocaine reported in that year. Have things changed since 2005? Statistics are vague. But over and beyond the larger parameters, the question remains, what is it exactly that Americans are looking for in their use of cocaine? It’s a tough question. We drink our caffeine in the morning to help us energize our day. And we need our cocaine exactly why? To balance our lives? To understand what fate has dealt us? To calm down? To attempt to reorganize? To stop and take measure? These are possibilities, openings for discussion. On the other hand, our government has looked at our needs and thought, “Well, the best way to deal with our citizens’ dependence on cocaine is to fumigate with glyphosate,” a pesticide manufactured by Monsanto among others, in Colombia. Let’s eradicate the source plant! What? In an effort to address drug consumption in the United States, the official US policy in Colombia, a major US ally in South America, has been to invest large amounts of money to drop uncountable quantities of glyphosate onto the Colombian countryside. Glyphosate is a weed-killer most familiarly known in the US as Roundup. In Colombia, for decades, the US has promoted the dumping of huge amounts of glyphosate in sensitive areas of Colombia in an attempt to eradicate the cultivation of the cocaine plant. As a consequence, have our needs changed in the U.S.? Nope. Because? Because the solution offered is so out of whack with the problem presented. Americans are using cocaine exactly why? What is it that drives us to cocaine? Colombia, thank goodness, has just in these past weeks decided to terminate the use of glyphosate within its borders in the eradication of coca. Citing a World Health Organization report that links glyphosate to cancer, the country has, according to the New York Times, defied the United States and ordered an immediate cessation to the fumigation of coca with glyphosate. So, are we any closer to understanding why Americans use cocaine? I don’t think so. Have we looked at the incubating sources of our drug use problem? I don’t think so. Have we possibly contributed to the development of cancer in populations in outlaying areas in rural Colombia? Possibly yes. Are some lives more dispensable than others? Possibly yes. What is the underlying problem? Why this continuing need for cocaine in our society? Let’s open this debate. Previous Post:The religious-identity spectrum: Is this the new LGBTQ+?